Ufone offers Ghata Package, with somewhat similar rates of its Ramada Offer, with some additional rates and daily subscription fee as well. 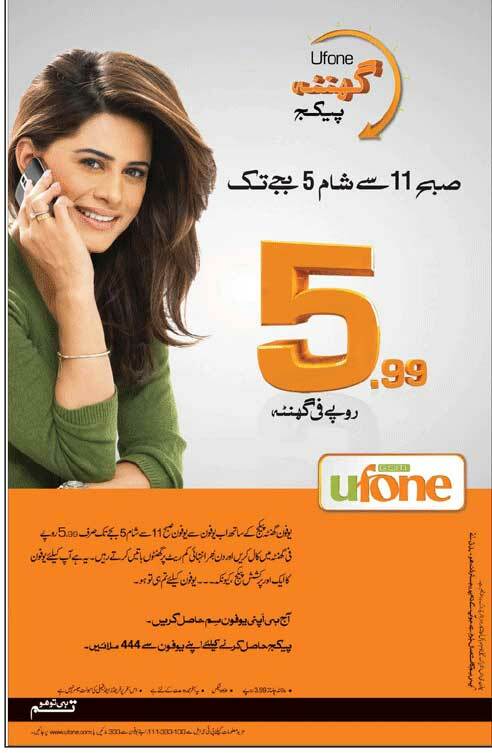 With Ghanta Package, Ufone customers can call one hour at Rs. 7.25 per on Ufone to Ufone calls between 11:00 AM to 5:00 PM. Customers will have to pay daily subscription fee of Rs. 4.84 per day. Due to increased tariff and daily subscription fee, customers may hesitate to use Ufone’s Ghanta Package – but still, for those who get engaged in long calls will capitalize it. Dial 444 to activate this package today and enjoy calling at the lowest rates for the longest time. No late night discount will be available on this package. FnF will not be available on this package. Voice bucket will not be available on this package. # FnF will not be available on this package. # Voice bucket will not be available on this package. i want to sale my numbers.03335517447,03215571447,03445571447,03005571447,03145571447 if u r in khan pur than i will give u 0685571447. plz contact at my cel no;03006726800,03326726800.
kion bhai kis khushi men…..!! life like a hell without friends …………love…………. Plz tell me the proceed of free calling in Pakistan. ya you are right say. It’s good but not,due to its daily charges.but still it’s good for lovers,who wants to talk long. 5 ka ghanta not acceptable because of its daily deduction its too much it should not be more than 1 rupe daily and per hour call charges inclusive of all tax should be 5.
tamam logon ki baaton ka koi faida nahi hai.Bcoz ufone ko jo RATe denay hotay hain wo aap ko ham ko mannay parengay.is liye tamam batoon ka koi hasil hosol nahi. ya ali madad……..salam subko…….mera hussain khush rahe bus ye he tere namaz he……. hi Ayesha How Are You. its unbelievably problematic package in a sense that there is always a network problem due to which the calls r dropped within 5 minutes whats the benefit of this package then? yaar rooz pasay na katea karo.not good of dely charges. This is very bad for its daily charges.me and every people are ignoree the ufone sim.becuse the deduction of daily charges and poor network. It’s okay, but the daily charges shoud remove for ghanta pakege ,otherwise less no of people well use . ufone se acha to jazz hai, ramzan or us k baad k liye package nikala 3.99 per hour..from 9am to 7pm………. dat pakage wx gud in wich U2U free call 4 a whole day . . .
ufone shud increase tim of ghanta pakage n daily charges shud finish . . . due to dis more pepl will use dis connection. p.t.a nay is silsilay main q action nhn lia k companies 10 paisay charge kur rahee hain jub k ye hi companies awam ko bewaqoof bana rahee hain , kq jub hum card load kurtay hain to 10 % withholding tax k saath satah 5 percent mazeed paisay katay jatay hain SERVICE CHARGES k naam pay to main ye pochta hoon beghairat PTA se k kia balance maloom kurna service charges main nhn aata ?????? its s very good pakage. ufone se achhi koi b cellular company pakistan main hai he nahi. I Love ufone . I apriciate to all ufone staf. I like supper ghanta package but i dont like daily charges. It should be changed. Or less then Rs 3.50 daily charges. It should be Rs 3.50 inculuded tax .